This release features work that will improve the organization of case materials and the work routines of administrators, committee managers, committee members, and candidates in Review, Promotion & Tenure. Improved packet transparency. 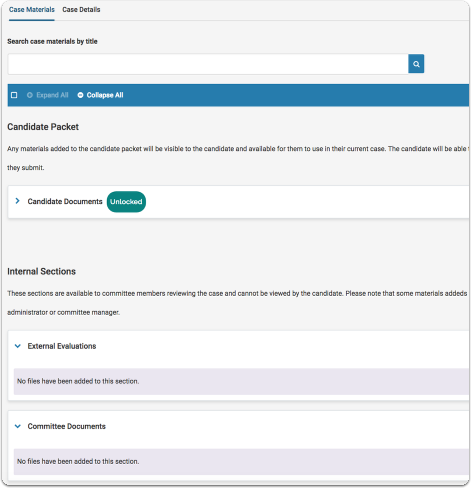 With this release we have updated the visual layout of the candidate packet (with some impact on the case creation process), so that the administrator view and the candidate view resemble each other much more closely. Reusing past case materials. 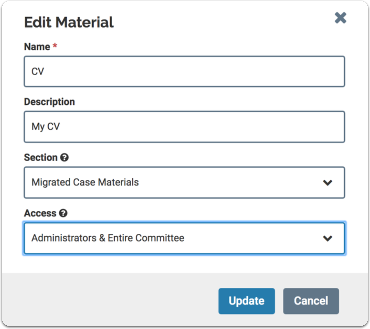 We have also added the ability for an Administrator to pre-populate a candidate's case with suggested materials pulled from that candidate's past cases which the candidate can accept, edit, or remove. What is it, what will change, and why? See here for a current list of known issues with this release. The following are known issues following the release on January 23rd, 2019. This list is being updated regularly, and issues are being removed as they are resolved. Slow Performance of RPT: We are currently working to address the issue of slow performance in RPT. Users are experiencing slowness when navigating through RPT and in particular when trying to send cases forward. In some instances the program is slow to refresh pages and appears to freeze when scrolling down the page. Also, in certain scenarios it takes a while for selected materials to be moved/reassigned to a new section. "Select All" checkbox selects unsubmitted forms (investigating if this is causing downloads to fail): Sporadic issues are being reported when attempting to download all case documents (both .zip and PDF). 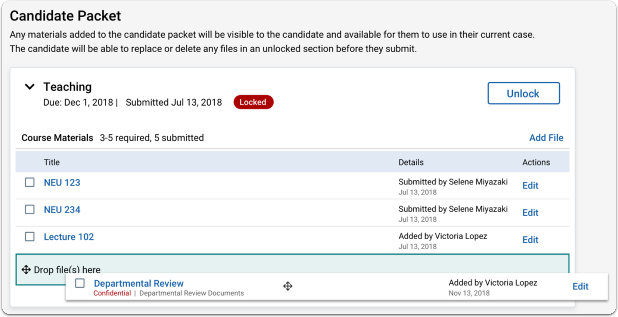 Additional docs section showing out of place for candidates: The candidate view (for a small number of candidates) is showing the additional document section after the first requirement and not after the last requirement in the section. Candidate Packet and Internal Documents sections switch order after searching materials: Problem happening if the order of sections has been modified to move the Candidate Packet below the Internal sections, in some cases the Candidate Packet moves back to the top after searching the case materials. 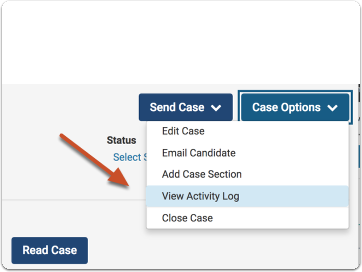 Attempting to move case forward, error "You must provide a subject": Some users report slowness when clicking to "Send case forward." After typing in a subject line in the message that will go out to reviewers gaining access, an error message displays: "You must provide a subject," even though there is a subject. After 30 seconds the error goes away. "Move" function not working when moving documents out of the Migrated Docs Section: Some users were experiencing problems when attempting to move documents out of the "Migrated Case Materials" section to another section and/or requirement. Checking the box for the document titled "Response" leaves the "Move" button grayed out and it gives this message "You can not move packet attachments and other candidate packet items at the same time." Candidate Packet and Internal Documents sections switch order after searching materials: If the order of sections has been changed by an Administrator to move the Candidate Packet below the Internal sections, the Candidate Packet moves back to the top after searching the case materials. 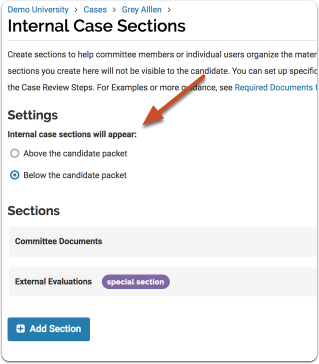 When moving the internal case section to the top and the candidate packet to the bottom of the page, they should remain in that order. Order of documents in the reader does not the match order on case materials (fix in progress): In some instances the case reader is displaying documents in a different order than found on the case details page. Administrators unable to delete case sections with no active documents: Some users are receiving the following message when trying to delete empty packet sections: "This section can't be deleted because it contains active documents." This message appears even though there are no active documents in the section. We are fixing these issues for our users and adding the ability for administrators to delete empty sections with documents that have been migrated to the Case Materials Internal Section. RPT: UI - Delete Sections with no Internal Documents: RPT Administrators should be able to delete empty sections whose documents have been migrated to the Case Materials internal section, so those empty sections can be removed. at I can remove those sections. RPT API loaded RPT docs stuck uploading: One client has reported documents not uploading to the Additional Documents section of the Candidate Packet. The documents that were uploaded have the spinning wheel. According to the client, the documents that were uploaded should have replaced the existing documents in the Evidence of Teaching Effectiveness section. Instead, they were created and are listed in the Additional Documents section. Additionally, it seems there have been multiple versions of the document created instead of replacing the original files. An RPT user looking at the candidate packet sees all the sections of the candidate's packet in the new "tile" design, where each section of the candidate packet displays on it's own tile. “Any materials added to the candidate packet will be visible to the candidate and available for them to use in their current case. The candidate will be able to replace or delete any files in an unlocked section before they submit." Shows date for votes, defaults to most recent. When there are voting results to display, the voting chart displays and "Edit Results" appears at the bottom beneath the display of all the voting info. RPT administrator or committee manager viewing a case page can reorder candidate packet sections, applicant sections, and internal sections via drag-n-drop (this function is not new, just added back with all the changes). Simply collapse all the sections with the "Collapse all" button in the top toolbar, and drag-n-drop to reorder sections. Note: Evaluators cannot use drag-n-drop and can’t reorder packet sections. RPT users now see the name of the template used for a case when viewing the case. We removed "Reviewing as," from the top part of the page, and that has become part of Case details. Note: When a case was created without a template they see "Custom Case" as the template name. . 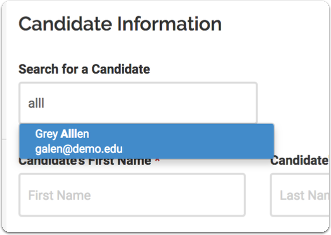 When filling out the "Candidate Information" section while creating a case for a faculty member, an RPT administrator will see a new field to search for the candidate's name. Entering the faculty member’s name in the field presents matches with users in the system. When the admin selects a user from the list of matching names, that user’s information is auto-populated into the candidate fields. Note: If the correct user does not appear as a match, a new user will be created with the information the admin adds. RPT Administrators creating or editing a template or case can set the internal section display order, specifying if Candidate Sections or Internal Case Sections display first on the case page of a candidate by clicking a radio button. The default selection is "Below the candidate packet." When the user changes the display order, they have the option to save or cancel the change. 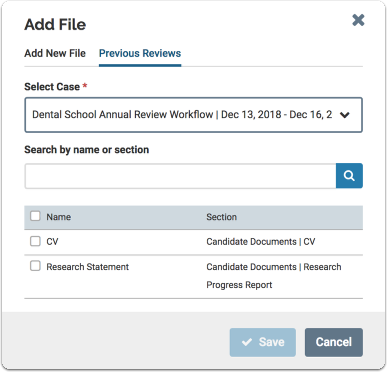 When an RPT user is viewing the case page, the default view will display all Candidate Sections grouped together and all Internal Case Sections (including External Evaluations) grouped together. Looking at the internal sections of a case or templates, the user sees a "Sections" header above the list of internal sections. Administrators can click and drag-n-drop to reorder internal sections for packets and templates. 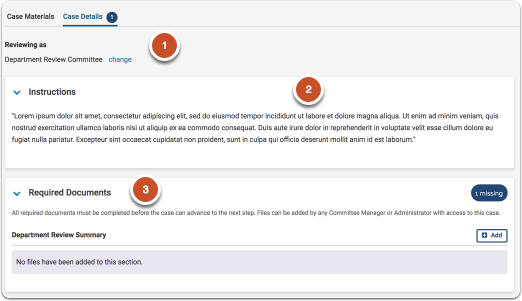 When an RPT Admin adds a new section, the new section will be placed at the bottom of the internal sections, and the user can click to drag and drop and reorder it along with the other sections. We restored the ability for Admins to reorder requirement sections for a template. RPT administrators can now include 1 or more materials from 1 or more previous reviews in a candidate's case. If the candidate does not have previous cases associated with them, the administrator will not see the “Previous Reviews" tab. RPT administrators creating a new case for a faculty member can access documents from a previous review for that same faculty member. 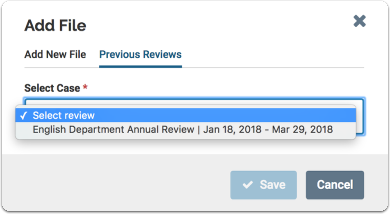 The "Previous Reviews" tab displays a drop down list of previous cases from which the admin or manager can select a previous review for the given applicant. The display includes the template name (if no template, Custom Workflow), the date the case was created, and the date the case was archived (if not archived, the date the case was created displays along with "not closed"). 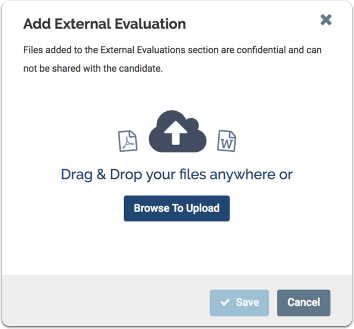 When adding a file from a previous case in internal sections, the user will not see external evaluations returned from that list. The display of sections and documents in the window should be identical between the Packet Sections and the Internal Sections. 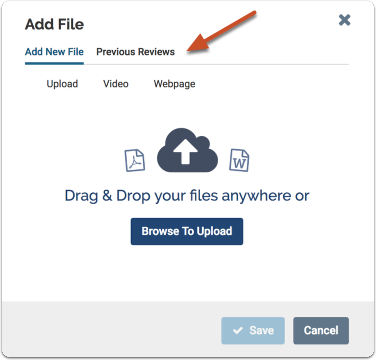 An RPT administrator on the “Add New File” tab will see our default upload prompt for 1 or more files, video, or webpage. 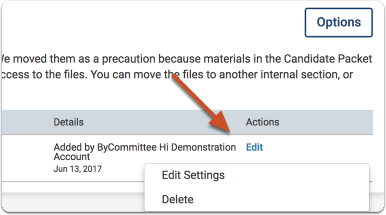 If the candidate has been notified of their case, when RPT Admin or CM adds a new artifact to the candidate requirement section, they will get an alert notice that tells them the file will be visible to the candidate and asks them to confirm they want it added. If user selects yes, then the file will be added to the packet. An administrator creating a case can upload a document as a fulfillment to a requirement on behalf of a candidate. These documents are added to the candidate’s dossier. Note: Once a document is moved or added to the Candidate Documents section on the candidate packet, it cannot be moved out of that section. 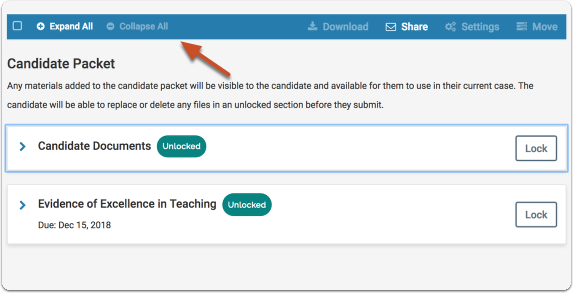 "Submitted by [Candidate First] [Candidate Last]"
"Added by [RPT User First] [RPT User Last]"
We’ve made changes to the relationship between packet attachments and the candidate portion of an RPT packet. 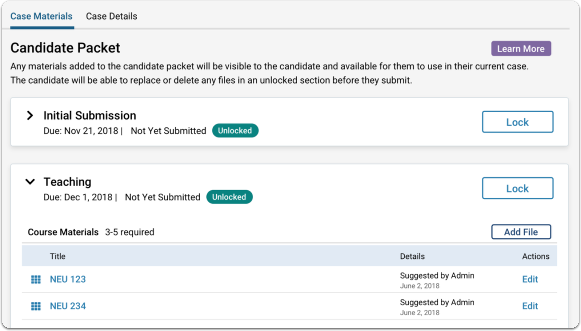 These changes allow an RPT CM/Admin users to select one or more packet attachments or packet links and drag them to a new target Candidate Requirement Section. 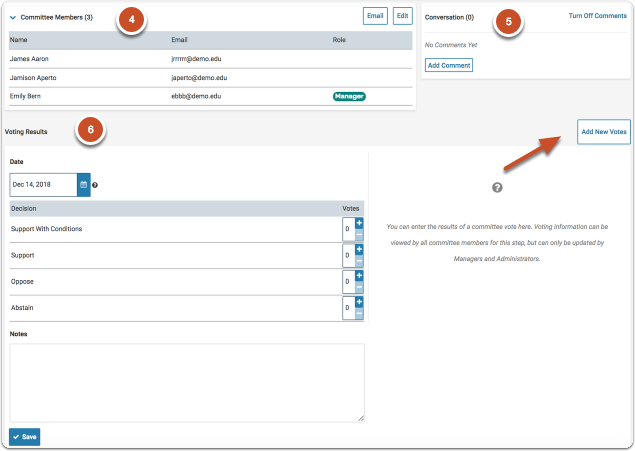 When a committee manager or admin clicks "Add" in the External Evaluations section, they can upload a document as a confidential attachment. RPT evaluators/CMs/Admins of the case will see the confidential attachments in their view of the packet. When an RPT administrator or committee manager adds a document to the external evaluation section, they will see a new window with only the upload document option, titled “Add External Evaluation.” When the user adds the evaluation, it will be treated as a confidential attachment instead of a packet attachment and is not available to the candidate. User sees this language in the window: "Files added to the External Evaluations section are confidential and can not be shared with the candidate." The new window mentioned above will not have the option to add “Video” or “Webpage” artifacts. Note: This release may change the sequence of your existing case sections. The order of your sections may move because we're more clearly distinguishing between sections that comprise the candidate's packet and those sections that include materials intended for use only by the institution. Files in the candidate's packet are visible to candidates. 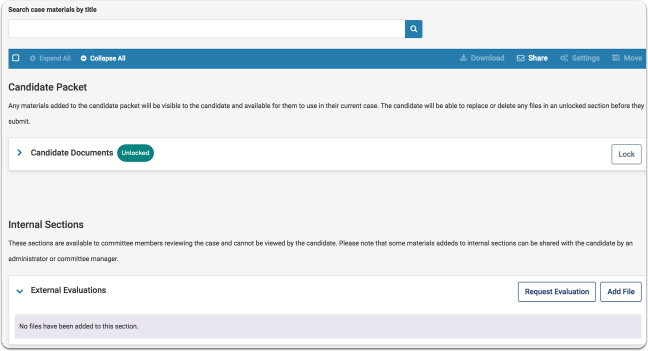 To make absolutely sure candidates only see materials our users intend for them to see, we have created a 'catchall' evaluator section named "Migrated Case Materials" for any packet that has packet attachments in either requirement sections or applicant sections. The materials that appear in this section were originally in the Candidate Packet section, but we moved them as a precaution because we cannot be sure the candidate should have access to the files. You can move the files to another internal section, or leave them here. 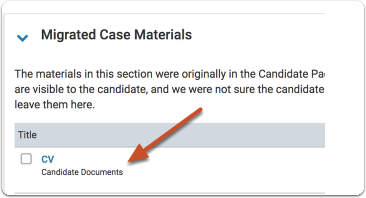 To make the post-release transition easier for our users, we now display information in the UI to let the user know the previous section assignment for all materials in the new catch-all Migrated Case Materials section. Packet attachments migrated to migrated case materials section show the previous section name below the document title. Administrators can edit settings of documents in the Migrated Case Section, including the document name, description, and access, as well as moving documents to another case section or deleting them. Because we have changed the sort order and presentation of packet materials, we now allow administrators to download a .csv file that includes information about the pre-release state of the packet. Most importantly, we show the sort order and the legacy section associated with each file. 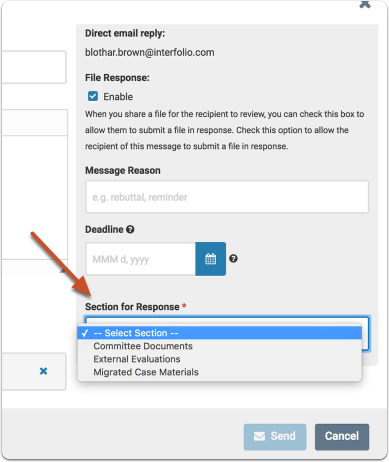 When an administrator or committee manager shares a file with a committee member and enables the option to submit a response, the user will only see internal sections of the case listed as available sections where they can place the response file when the response comes in. 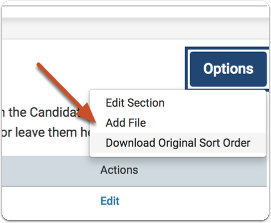 When an administrator or committee manager shares a file with a candidate and enables the option to submit a response, the user can choose to place the response file in any section when the response comes in. When users upload documents that will be converted to .pdf (fulfillments, packet attachments, confidential attachments, and external evals), we now update the Document Status on the page while the document is pending conversion, until the document is converted successfully. The page updates the document with a hyperlinked name and received data when successfully converted, and updates the document to show error status if errors occur in conversion. When RPT user views the materials associated with Candidate Requirement Sections, they will see the same presentation as the candidate. After an applicant submits a section, the section appears as collapsed by default on the packet requirements tab of the packet. If the section is editable, and the applicant expands it, and adds a document to a requirement within that section, the section then auto collapses again after the document is successfully added. The section stays expanded until the user re-collapses it on their own or they refresh / leave the page. The header will be the template name, when the case has no template name because it is created from a blank case (there is no template name), the Candidate Name will appear as the header. Whether the section is "Submitted" or "Not Yet Submitted"
When a section is locked, the action is to "View"
When a section is unlocked, the action is to "Edit"
If the candidate has ability (permission) to add their own section they have an option to edit the name and description of that section. User can open the applicant section edit modal by clicking the edit button for an applicant section, and can edit the name and description of the applicant section. We have removed removed the “Committee Files” link. 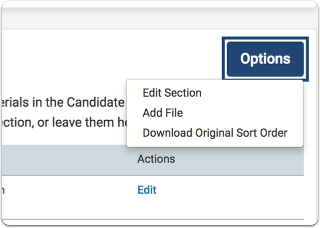 If 1 or more files have been shared with the candidate, the candidate will see a "Shared Committee Files" tab when viewing their case. Message: The section “section_name” cannot be submitted because you have not added all the materials required to complete and submit the section. Please review the list of required materials to see what materials you may be missing. You can submit the section once you have uploaded all required materials." Message: You cannot edit the documents and forms within a section once it has been submitted. An administrator will need to unlock the section in order for you to make any changes. Are you sure you want to submit the section “section_name” at this time? Body: The section is now available to the appropriate committee members for review. We have taken measures to prevent candidates from adding more than the required number of documents for a given document requirement before submitting their packet. When a candidate adds more documents than the required number, the number added changes color and is bolded to draw attention to the error. When the candidate selects more than 1 section, the Preview Sections button will enable (preview the sections the user selected), and the Submit Sections button will enable (submit the sections selected). When the user selects to "Preview Sections" they get a viewer with only the sections they selected in the order they will be sent to RPT. You cannot edit the documents and forms within a section once it has been submitted. An administrator will need to unlock the section in order for you to make any changes. Are you sure you want to submit the section “section_name” at this time? When user select yes to submit the sections the sections should submit and should be locked on apply. An email should be sent to everyone on the current step (committee members, committee managers, assigned administrators) to inform them that new sections were submitted. 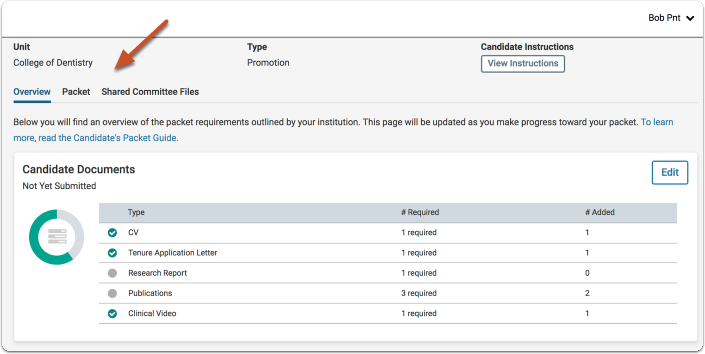 If the user has selected sections that have not satisfied the requirements, the "Submit Section" button should remain disabled, and the hover error should change to say " Some sections cannot be submitted because there are issues with the requirements"
The candidate can see that an RPT administrator has suggested a particular material for use before they submit the section: “Suggested by Administrator." Candidates can move fulfillment from one required document to another. Fulfillment can only be moved to and from required document. 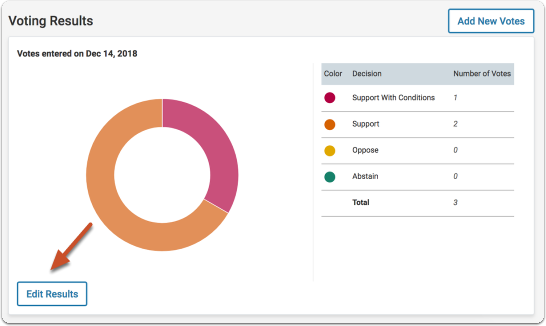 We have made numerous changes to improve accessibility and make the candidate packet easier to navigate by implementing new compliant designs, and A11y features for drag-n-drop, and action tool bar procedures.